My name is Emily and this is my blog. I live in a one-room studio in Park Slope, Brooklyn. I have no closets and my bathroom was a closet! While my favorite foods are healthy foods I in no way have a “clean diet.” My popcorn obsession puts me in a different class of eaters than the food bloggers I’ve seen! So I’m starting this blog to represent all of the rest of us. Also…due to a ridiculously stressful 1st year of teaching and a husband who eats like five husbands I gained 10 pounds over the last half a year. That’s enough to make me still smaller than most of America, but unable to fit into my pants! I’ve read the studies; food blogs are the most successful addition to a healthy diet and exercise in aiding weight-loss. Let’s hear it for accountability. Hi, just found the blog and can’t wait to read more! Thank you so much! You don’t know how excited I got to see a comment posted! I’ll post some more wedding photos soon as well. I got burnt-out on popcorn until we bought a old air popper at Goodwill. I just spray the popped corn with olive oil spray and salt, then toss. Yummy! Congrats on your new blog adventure! Naturallycheryl – that sounds yummy! I actually much prefer air popped, and was given a great popper for my wedding, but with the apartment I’m in we barely have room for the bags of popcorn! I am also a popcorn addict! We had to quit buying it. emily – nice name btw! That is kind of our situation! I actually went about 4months without any, but when I cracked I add a TON. Right now I’m on a minibag kick. Thanks for commenting on my blog. I am looking forward to reading more of yours! Good luck with the blog. I just found it and am looking forward to catching up. I am currently student teaching (after changing careers)! *Hangry Pants – thanks! And good luck to you; I think pretty much universally student teaching is synonymous with happy hour. Yay for teachers! I love your blog, I am so glad you commented on mine so I found you! 🙂 I am looking forwarding to reading about your busy lifestyle as well!! Ali – thank you! then I’ll have at least one reader who doesn’t think I’m crazy! just found your site 🙂 it looks great. yay for food blogging! and for popcorn! I love it too. I just found this blog and I’m already a HUGE fan! You eat real people food too! 🙂 I also teach – undergrads – and am recently married and I KNOW HOW YOU FEEL! My husband is a freakin’ garbage can! Anyways, I can’t wait to hear more from you. Thanks for the welcome!! I was just in your neck of the woods, LOVE IT!! You east coasters sure do have some small living spaces, haha but it’s way cozy and seems like such a fun place to live! hahahaha , i love your persona. you frickin rock!!! awww, cute comment from mom! 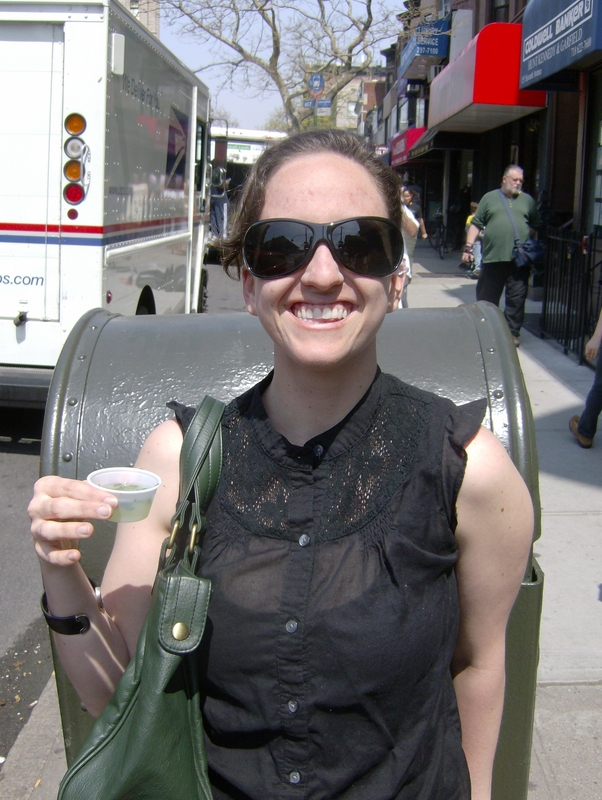 Thanks for visiting my blog, and yayyyyy (sort of, haha) for NYC. I live in the slope, too. AND I have made the leap back to grad school (though for social work and not nutrition — I want to keep nutrition fun! ), so let me know if you have questions about making the switch. I’m looking forward to reading your blog, too! we have so much in common! I live with my boyfriend in a studio in park slope, and I am trying to become a teacher through nyctf or tfa! Can’t wait to check out your blog. Hi Emily! I just found your blog and reading it really makes me miss the city! I just moved out of NYC about 6 months ago and I miss is tremendously! I too just started my own blog, I hope you’ll check it out as well! Cool! 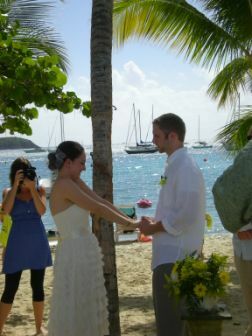 We got married on the beach, too! PS The comment from Mom is too cute! Love your blog Emily! Don’t ever tire of writing! P.S. Oh, I’m getting an error message. I hope you check back to give me the address! shteyndl – it is so good to hear from you! I’m actually not vegan, it’s just something I’m trying for two weeks. I’m actually not even vegetarian, just mostly vegetarian (I don’t eat mammals). I will absolutly come over to check on the blog! Hi! So weird, I’m not sure why that was happening. I think this should work now! haha- we have alot in common!! I just quit my teaching job to go back to school to become an RD! I say take the leap!! Hi! Just found your blog and I’m looking forward to reading more. I’m an RD- its a great profession- I’ll be happy to answer any questions if I can. I’ll keep reading! angiesappetite – thank you so much! How lucky you live in Park Slope! I LOVE that area.